Update: Apple pulled this update after reports that the installation process caused problems for some people. It has since reissued it. We've updated a second-generation Apple TV with the reissued update with no issues. 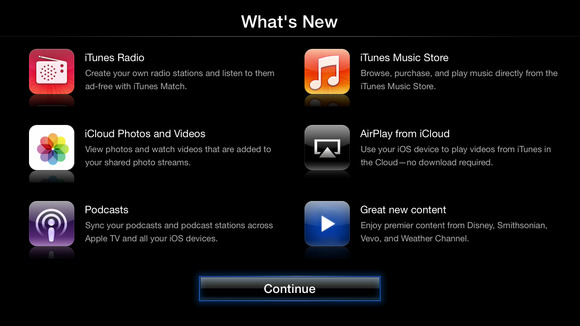 While you were out standing in line for an elusive gold iPhone 5s, Apple quietly rolled out the latest Apple TV update. Unlike previous updates that added new channels, version 6 of the Apple TV firmware goes under the hood, adding support for Apple’s iTunes Radio streaming service, allowing purchases from the iTunes music store, supporting podcast syncing, and providing access to shared iCloud Photo Streams. Additionally you can stream purchased iTunes content via iCloud to any Apple TV, even when it isn’t currently using your iTunes credentials. The new iTunes Radio fills the fourth spot on the top row of Apple TV’s apps. Launch it, wait a while as it loads, and the iTunes Radio screen appears. Along the top are Stations, Add Station, Edit Stations, and History headings. Choose Stations and you’ll see a row of Apple’s preconfigured stations (playlists) and then the My Stations entries below. Just as with iOS 7’s Music app, you add stations by clicking an Add Station button. 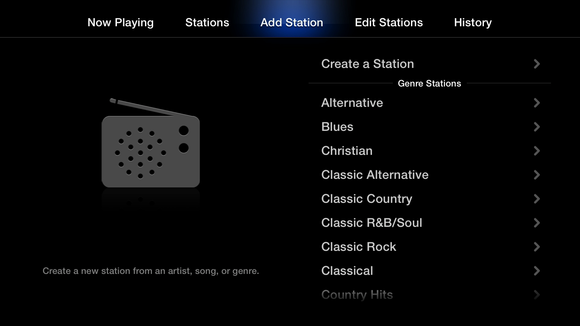 This produces the Add Station screen where you can select a genre and then sub-genre—Alternative > Indie Rock, for example, and highlight and click a plus (+) button to add the station. 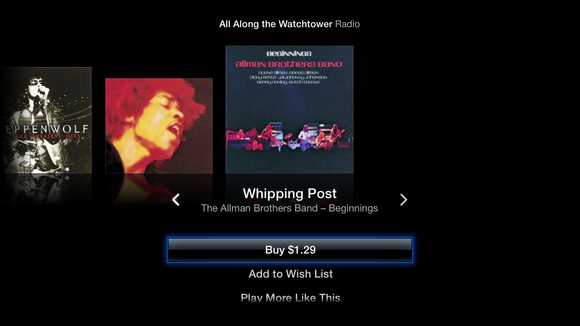 Adding iTunes Radio stations on Apple TV. On the Now Playing screen you can start and stop playback with the remote’s Play/Pause button. To see additional options, press and hold the remote’s Down button. Do this and you can access the Play More Like This, Never Play This Song, and New Station From Artist options. Navigate to the Edit Stations screen and you can enable or disable the Explicit Music option as well as select a station and click the Trash icon next to it to delete the station. If, instead, you highlight the station and click you find options for tuning the station (choosing between Hits, Variety, and Discovery), Play More Like This (artist, song, or genre), Never Play This (artist, song, or genre), and Delete Station. Choose History and you’ll see those tracks you’ve played as well as have access to your Wish List. All the data you find within the Apple TV’s iTunes Radio area is synced over iCloud from other devices, which explains why you need to be running iOS 7 and iTunes 11.1 (along with OS X Lion or later) to use it. In the past you’ve been able to purchase videos directly from your Apple TV. Now you can do the same with music. Just select the Music entry, navigate to an album or track you wish to purchase, highlight its price, and press the remote’s Select button to purchase it. You’ll be asked to confirm that you really want to purchase the song. Confirm that you do and the track will be made available to the devices associated with your Apple ID. As with video, songs are not stored on the Apple TV although they can be downloaded to your computer and iOS devices. 'Scuse me while I buy this track. This feature is nearly transparent. Here’s the idea. You’re visiting a friend and you have an iOS device with you. After connecting to the same network used by the Apple TV you go to the Videos app on your iPhone, iPod touch, or iPad and you look for a movie that you’ve purchased from the iTunes Store. Tap on it and select your pal’s Apple TV as the AirPlay device to play it on. 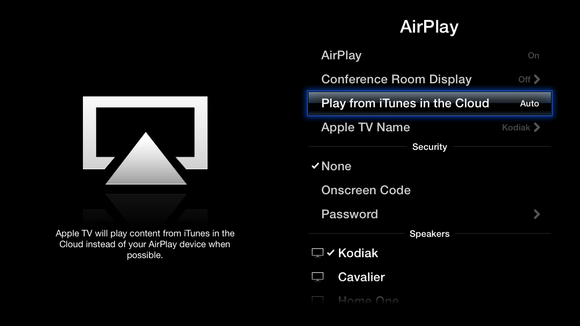 Within the Apple TV’s AirPlay settings is a new Play From iTunes In The Cloud setting that’s set to Auto by default. When you configure your iOS device to stream its content to the Apple TV via AirPlay and then tap a movie on iCloud to play, Apple confirms with the iOS device that it’s authorized to play that content. Once authorized the Apple TV will play it, but not streamed from the iOS device but rather streamed from Apple’s servers. You can then switch to another app on your iOS device or even put it to sleep. But you can’t quit the host application—Music or Videos. If you do, playback on the Apple TV will stop. With "Play From iTunes in the Cloud" enabled, you can ask your Apple TV to stream content it doesn't own to your TV. The Apple TV will now sync podcasts between itself and iOS devices. Any podcasts you’ve subscribed to on other devices will now appear on your Apple TV when you select Podcasts from the Apple TV’s main menu. Additionally, play points are remembered. So if you’ve listened to only half of a podcast episode in the car, you can pick up where you left off in the living room. 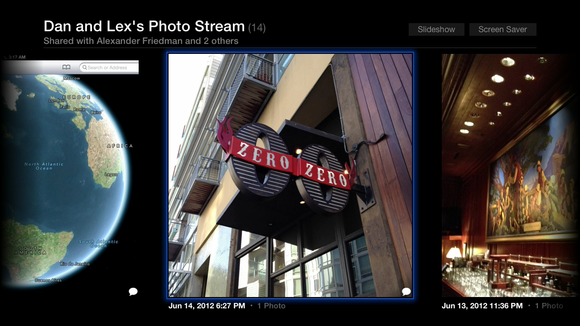 Finally, the latest Apple TV software includes an update to Photo Stream that enhances shared streams. You can now comment and "like" images within a shared stream—even if it's your own stream—directly on the Apple TV. You can't, however, delete or add images in a shared stream on the Apple TV. Comment and like photos in a shared stream.